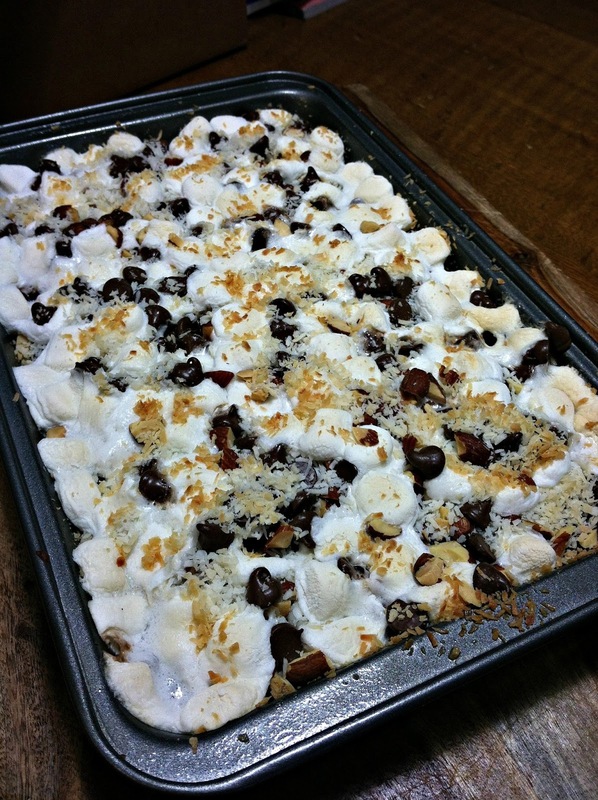 theFoodette & Family: Loaded Brownies for a Virtual Birthday Party! Loaded Brownies for a Virtual Birthday Party! My bloggy-friend Meghan from The Tasty Fork is having a virtual birthday party! 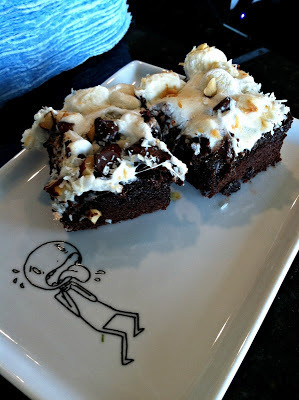 For this party I am bringing these Loaded Brownies! These babies come complete with salted almonds, shredded coconut, melted marshmallows, and chocolate chips. Holy-Moly, y'all, these are decadent! I baked these in my Perfect Brownie Baking Pan-- if you don't have one of these things, get one! I love this pan. I am kind of challenged when it comes to evenly slicing things like cake and brownies. My pieces always come out all wonky and different sized, but not with my Perfect Brownie Pan! For these scrumptious little bites I took a regular old fat-free brownie mix and decided to load it up with my favorite baking ingredients... I mean, would it be a Susan-dessert without coconut!? Uhh, No. I chose a fat-free brownie mix, by the way, just because I knew I'd be loading up the top of it with plenty of extra calories. I call that using my thinking brain! Plus, mixes make my life super easy. I mean I just stirred in a bit of hot water, poured the better into the pan, and threw 'em in the oven! 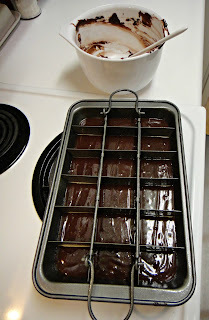 After the brownies baked, I removed the little metal divider-thingy and got to the toppings! this is a funny plate, not a comment on the brownies! Preheat oven to 300*. Spray your brownie pan, set aside. Stir together brownie mix and hot water, making sure all the mix on the bottom gets incorporated. SERVE WARM AND GOOEY! ENJOY! That plate is so cute! I would like one of these brownies. Right now! Yummy! Loaded Brownies!!! I'm dying over these!! I wish I was sitting with you right now eating these. Thank you so much for sharing this recipe for my Birthday!!! That plate is adorable! Those brownies sound beyond decadent! YUM! Happy Birthday to your friend! Thanks for linking these up! These looks sooooo delicious! It's making me hungry! Definitely pinning to my food board :o) Have a great night! These look so good! And I love that plate! Pinning to my Sweet Treats and MM board. Thanks for sharing at Marvelous Mondays and Meghan's party! Oh my gosh those look amazing!!! Thanks for linking up with Pin It! Tuesday! Hope to see you there again next week! Stopping by from Wonderful Food Wednesday - have a great weeK! Brownies are such a fav in my house! These look great! Thanks for sharing!New follower via bloglovin, stopping by from Wonderful Food Wednesday Hop! Would love for you to stop by at http://unravelingends.blogspot.com/ I also have a hop going on ;)!!! !